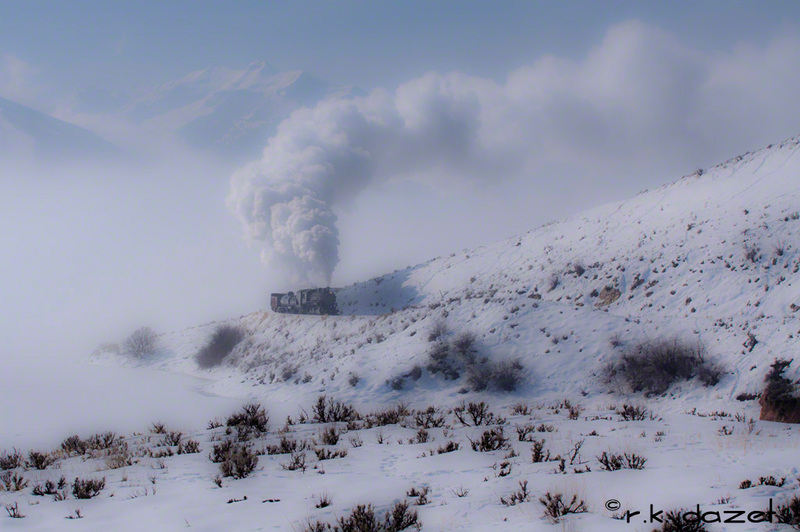 Early February 16, 2010, Heber Valley Railroad Engine 618 pulls a photo freight along a frozen Deer Creek Reservoir. Minolta 7D, 1/250 f10 @70mm. Its been a lot hot summer here in Utah! It has me thinking of cooler times! How about some ice to help cool down? This Photo was taken early February 16, 2010 along a frozen Deer Creek Reservoir, Utah. The Sun Setting on “The Middle of Nowhere”! Well actually I was in the middle of two sets of tracks at a grade crossing — the UP on my left and the UTA Front Runner on my right. I was composing this image with my tripod-mounted Minolta Dynax 7 when I saw a figure in dark clothing approaching out of the corner of my eye. This wasn’t a bad neighborhood, but maybe not the best either, so naturally alarm bells were ringing! “Son, we gonna have to shut you down”, a voice said to me! I looked up to find a Union Pacific police officer in dark blue uniform. He said that if I was still behind the crossing gates when they went down, he would have ticket me! I complied! But not before snapping this shot! Every picture tells a story? May 10, 1869 — You are there! I had the good fortune of being there! Actual capture date was May 10, 2012. 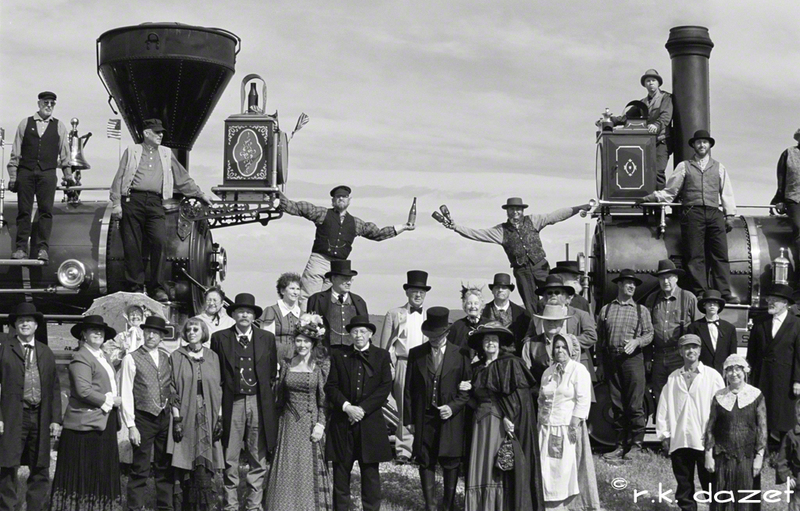 The event was the annual reenactment celebrating the completion of the Transcontinental Railroad with the driving the Golden Spike at Promontory, Utah. We had good friends visiting from Germany. Gerd Stephan is a fellow railroad fan and there was no way I was going to let him miss this Golden Spike Reenactment. 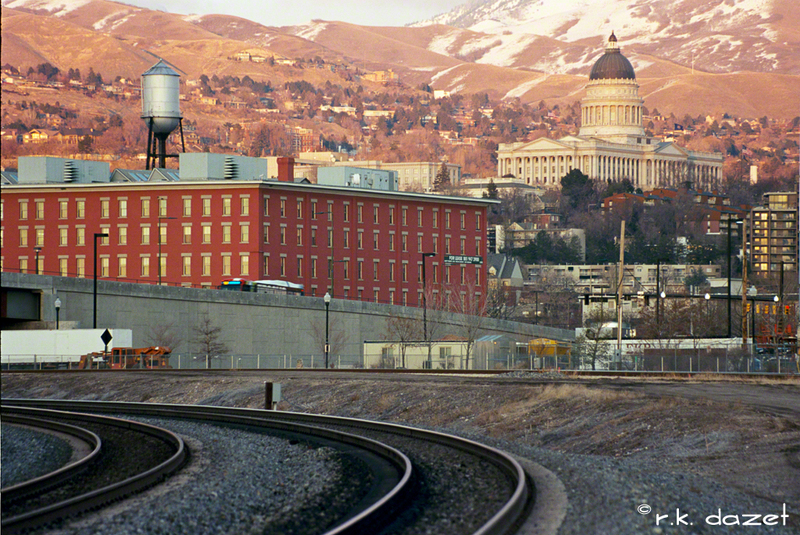 The image was captured on Kodak Ektar 100 and scanned in 16bit greyscale.